Tennis Psychology: Andy Murray – You Should Be In Bed! Martin Perry 31st January 2016 31st January 2016 Comments Off on Tennis Psychology: Andy Murray – You Should Be In Bed! It’s late Saturday night in Melbourne Park. Jamie Murray has just secured his first mens doubles title. In the players box recording his victory speech is his brother Andy. A nice touch. Apart from one thing. The next day Andy will be in the Mens Singles Final against the force that is Novak Djokovic. Is this the best mental, physical and emotional preparation for Andy Murray to secure his first Australian title? Seemingly not. From very early on, it is evident that Murray is off his game. Looking low in energy…listless…unable to put any pressure on the defending champion , who cruises to a 6-1 first set, Despite an improvement in the second and third sets, its a comfortable title defence for Novak. Murray’s late night support for his brother, betrayed where his distracted emotions were at. 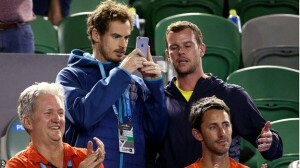 With his wife expecting, Murray jumped on the first plane out of Melbourne. And that is very understandable. But when you are taking on Novak Djokovic in a Grand Slam final, you cannot be betrayed by contradictions. Every single ounce of energy has to be directed into the task at hand. By being on hand to record Jamie’s maiden Grand Slam title. Andy signalled where his priorities were. This was a time for family. Moments never to be repeated for sure. A special time for the Murray family. But family energy is not going to help you beat Novak Djokovic. A champion at the very top of his game. To be a winner and a champion, you have to make many sacrifices. As Andy Murray has done. But its as if the distractions of the imminent birth of his child, and the illness last week of his father-in-law, drained and weakened Andy’s will and resolve. And again that is entirely understandable. But Novak Djokovic has raised the bar. Set benchmarks for mental, emotional and physical fitness. And to beat him in a Grand Slam you have to at least match those levels. Then outplay him! With a distracted mind, it maybe that Andy Murray already felt that he couldn’t win the Australian Singles Title yesterday. Otherwise why else would his brother say to him in public, ‘Andy, you should be in bed, Not here taking photos’!